The Diet enacted legislation Wednesday to lower the voting age to 18 from 20 — the biggest reform of the nation’s electoral laws in 70 years — in an attempt at encouraging younger voters to be more politically active. The bill to revise the Public Offices Election Law passed the Upper House unanimously after winning approval in the Lower House on June 4. The voting age was last changed in 1945, when it was lowered to 20 from 25. The change is almost certain to apply to an Upper House election scheduled for summer 2016, unless the more powerful Lower House is dissolved first for a snap election. Some 2.4 million people aged 18 and 19 will join the electorate. The change will make it important to educate senior high school and university students about their newly acquired right to vote, he added. The revised law will be promulgated in about a week and will take effect in a year. It will apply to both national and local elections held after that. 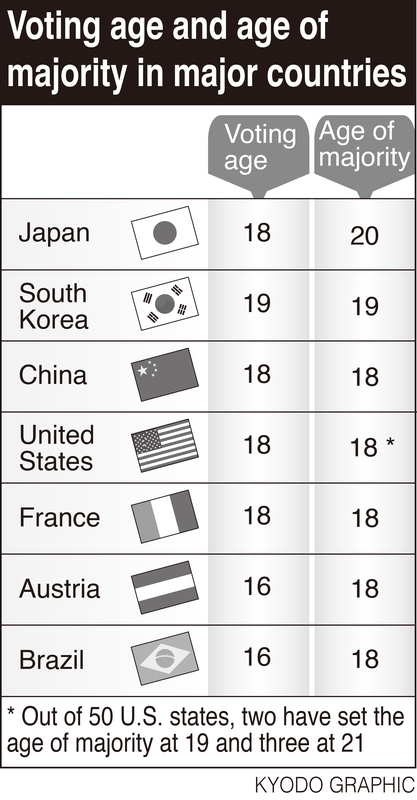 Over 80 percent of the 198 countries and regions surveyed by the National Diet Library in 2014 had set their minimum voting ages at 18. The change would require political parties to cater to a wider voter base, as observers say many have tended to focus on the elderly, who have a higher turnout rate than their younger compatriots. 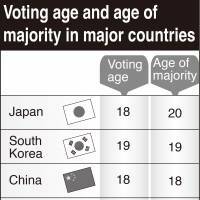 With voter apathy in recent elections more prevalent among young voters than the middle-aged and elderly, Japan faces a challenge in getting more young people involved in the political process. The legislative work comes as the ruling Liberal Democratic Party headed by Prime Minister Shinzo Abe seeks to amend the war-renouncing Constitution for the first time since it took effect nearly 70 years ago. The minimum voting age for national referendums on constitutional amendments is already set to be reduced to 18 from 20 in 2018, under a revision to the national referendum law that was enacted last year. In line with the lowering of the voting age, lawmakers are also expected to consider reducing the statutory age of adulthood from 20 and the maximum age covered by the Juvenile Law from 19. The issue of lowering the age ceiling in the Juvenile Law is especially controversial because some question whether 18- and 19-year-olds should be punished in the same manner as adults. Lawmakers will also consider lowering the minimum age for eligibility to run for public office. Currently, candidates must be at least 25 years old to run in Lower House elections and at least 30 years old to run for Upper House seats. The voting age reduction will also allow 18- and 19-year-olds to engage in election campaigns. But it means that in principle, they will be sent to prosecutors for possible prosecution if they are suspected of committing serious violations of electoral laws, such as vote buying.